Swanson, John August. 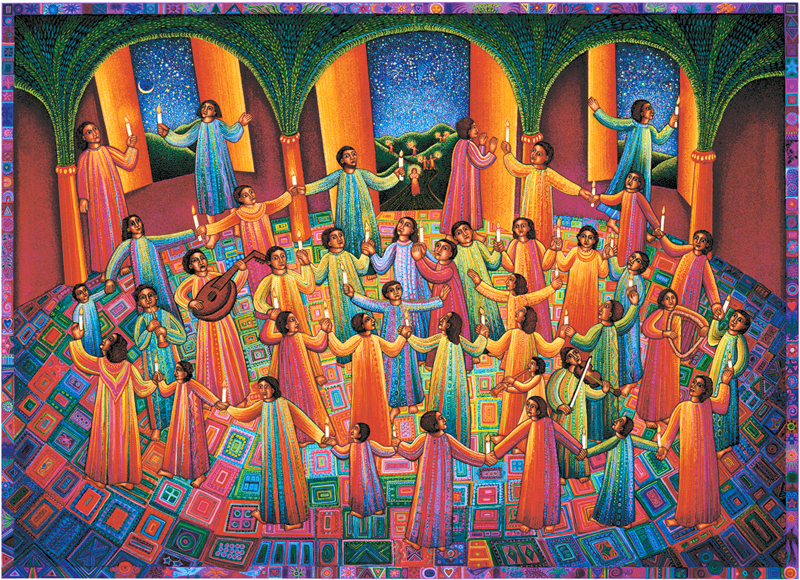 Celebration, from Art in the Christian Tradition, a project of the Vanderbilt Divinity Library, Nashville, TN. http://diglib.library.vanderbilt.edu/act-imagelink.pl?RC=56538[retrieved September 12, 2018]. Original source: www.JohnAugustSwanson.com - copyright 1997 by John August Swanson. Last week we took a look at the second and probably most famous chapter in James when he challenges the church not just to speak but to act on their convictions: What good is it, my brothers and sisters, if you sayyou have faith but do not have works? Now in our passage for today, which comes in just the next chapter, James turns his attention from the power of actions back to the power of words. Just like a horse’s entire body can be controlled and directed by a bit in its mouth, or a massive ship is guided through the water by a small rudder, he says, “So also the tongue is a small member, yet it boasts great things,” as one translation puts it. Just like a whole forest can be set ablaze by a single spark, a tongue too can set things on fire—things like friendships, marriages, communities, lives and livelihoods. We all know this intimately. As we’ve seen over the last couple of weeks looking at James, his outlook on the world and humanity and even Christian community is what some would call bleak, and others would say is realistic—again the power of language. But he’s speaking from within in an entire biblical tradition that attests to the power of words that can be summoned for good and ill—“to bless God and curse those made in the image of God,” as he puts it. In fact, scripture suggests there may be no greater power in the world than the power of words. From the opening chapter of Genesis we’re told it was the power of words that created the world. In the beginning God speaks and calls creation into existence. Let the waters be separated and let there be dry land! Let there be animals and plants and finally humans—and it was all so. Let all of this be good, and even very good, we’re told,and it was so. The Gospel of John tells us it was that same Word, that same force of creation and imagination, “through whom all things came into being,” that became flesh and lived among us in the person of Jesus—recreating, reshaping the world to be more in God’s image. And the same is true of our speech. The language we use, the words we choose, shape our world—how we see and understand it. Who we understand ourselves and others to be. This is so essential a truth that it’s difficult for us even to see the ways it’s true. It’s like that story about the two young fish swimming through the water who happen upon a slightly older, wiser fish, who says to them, Top of the morning boys! How’s the water today?And the two younger fish kind of give him that half smile and a nod that younger fish give older fish. They keep swimming for a minute when one of them leans to the other and says, What the heck is water? And so animals and insects aren’t just “organisms,” but “creatures”—thing who were and are created. Our identity as “humans” actually preserves our scriptural origins though we don’t often think of it: we are “ones who come from the humus,” the soil, the dirt. The work of God’s hands, the bearers of God’s image. And for Christians, other people aren’t just other people, they’re our neighbors. Isn’t that word powerful? It forces us into relationship. As a Christian person we’re not permitted to see people as other, they’re always neighbor. Even when they’re an enemy, they’re still a neighbor—we’re called to love’em all. Words matter. They shape our world. Sometimes reshape it. Our faith teaches us they can make all the difference. We talked about these things this past Wednesday when our newly formed “accessibility servant team” led our program. They’ll be leading again this week and perhaps a couple more weeks later on in the fall. But this past week they focused on those with intellectual or developmental disabilities. We’re blessed to have several folks within our membership who work with people with people with disabilities and so they were able to share about some of the services available here locally as well as their approach at working with folks with these kinds of disabilities. Amy Alderman shared about her approach to working with autistic children at Woodfield Academy, where she teaches. Greta O’Dell shared about her work at River Edge, where she’s the director of services for folks with intellectual and developmental disabilities. And Greta in particular spoke about the importance of the language we use to speak of those with disabilities. We show that we value words in the way we choose them in our personal relationships, how we talk to each other. But we in the church also show that we value language when we’re thoughtful about the words we use together, particular words we use together in worship. There’s an old axiom in the church that in Latin reads: lex orandi, lex credendi, which translates roughly to “as the church prays, so it believes,” reminding us of the power of worship, that what we do in the context of worship—the words we say, the hymns we sing, the prayers we lift up—it all shapes what we believe.In some ways it’s like that classic quote from Churchill, “We shape our buildings and thereafter they shape us,” pointing to the power of design to shape our lives. The language of our worship is the same, it shapes what we believe, in ways we’re not always aware until we experience something different. I didn’t really think about the power of language in worship until I went to divinity school, where of course I was exposed to different books and ideas and theologies which were all hugely important. But what I remember most is experiencing different language in worship. I attended and then would later serve as student pastor in a small, multi-cultural church in Jamaica Plain, a neighborhood in South Boston. It’s an incredible church—so different from any church I’ve been a part of. I remember the first Sunday I worshipped there. We were meeting in a doublewide trailer park on the church lawn because the 150-year-old sanctuary had burned down from a fire several months before. But there in that “sacred doublewide,” as we began to call it, were all different kinds of people: white, black, brown, folks from the neighborhood, folks who’d ridden the train in from the suburbs. Homeless people and seminary professors, and so many different languages. I remember when it came time to recite the Lord’s Prayer the pastor invited us all to say it in the version that was most comfortable for us. I assumed she just meant to pick either trespasses or debts, but when we all began to recite it I realized she was inviting us to something much more expansive. There were folks who said “thy kingdomcome, thy will be done,” and others who said “thy kin-domcome” as in kinship—“the time when all will be family” come. And of course there were trespasses and their were debts—maybe even a few “sins” thrown in to boot—It was a holy cacophony of prayer! And it was beautiful…eventually. At first it was a little disorienting and even made me a little uncomfortable. Could we do this? Was the language of worship really this malleable?But as it washed over me week after week, it occurred to me that maybe it’s not such a bad thing for the language of worship to unsettle us from time to time—to challenge us, to dislocate, ever so slightly, us from our rhythms and habits and assumptions and open us up to new possibilities to experience the mercy of God and remind us that God is so much more than any imperfect language we have for God. God can of course be father, but isn’t God also mother? And when we lift up both of these aren’t we pointing to the fullness of God that is so beyond speech, but that we get closer to the more language we make available to ourselves? And I remember sitting in that little doublewide trailer, week after week and feeling how gradually and in ways that are difficult to explain, the words I was saying and the words they were saying slowly became the words wewere saying. And they began to matter in ways they hadn’t until then. And I realized my God was getting bigger, so much more beyond me than God had been before. It was powerful. The tongue can set a forest ablaze, but it can also plant a seed. It can also allow new things to grow. A community centered on the Word of God incarnate knows and values the power of words to shape our world: our relationships with others, to bless or curse, in include or exclude, to open or to close. To shape how we understand others and ourselves and this creation into which we were made. And the words we use here together are especially powerful in that they shape the gospel: God’s message of love and healing and wholeness for the world—even our understanding of who this God is. Our words involve us in the work that God has been up to since the beginning: calling creation into being, bringing light to dark places, seeing us through the raging waters, looking at the world and the people and things who live within it and saying, You are God’s beloved. In a word, our words make us God’s people. And to that we say, Amen. David Foster Wallace tells this story in This Is Water.